During my second year in the Graphic Design program at Durham College, I fell in love with fonts and typography. Our life long love affair had its start in my typography class, where ironically enough, my professor’s name was Ab, the first two letters of the English alphabet. His passion for the artform and for type’s anatomy really drew me in (no pun intended!) and before I knew it, I was a goner for typography. For weeks, Ab had us illustrate fonts by hand; needless to say, by the course’s end, we understood typography on a different level. We knew the difference between a serif and san serif font, understood each letter’s antimony and learned to appreciate the brilliance of Staedtler pigment markers — sizes 0.1 through to 0.8. Any designer reading this who has ever hand-rendered an alphabet will understand the importance of a good marker. In the past decade, font awareness and typography have become a larger part of mainstream culture than it once was. Documentaries such as ‘Helvetica’ by Gary Hustwit and news coverage about people who dislike Comic Sans or Times New Roman demonstrate just how important typography is. Yet despite this surge of interest in typography and how it shapes our world, I’ve had to explain or even sometimes defend why anybody should care about typography numerous times over my 20 years in the creative sector. It has become something I’m simply used to and I’m well prepared to stand up for typography and its benefits. So why do I love typography? What makes it important? And what exactly is typography anyway? Well, I had to give her credit; she had the most basic understanding down! There is, however, so much more beyond that, so much more than it just being letters that make up the alphabet. Typography is defined the style or appearance of fonts in an arrangement of any given space. Simple, yes? Many people view it as just that. But for me, I see it differently; typography is the key ingredient to good design — it makes the recipe a huge success…or a huge disaster. Typography can make or break a design and it can add an element that makes said designs stand out among the crowd. Fashion and interior design have similar attributes to a good typeface. Typefaces are visually attractive, comfortable, entertaining and pleasant to the eye and serve a purpose. A well-laid document always includes strong typography that sings a special melody and contributes to a document’s orchestra stage grid. 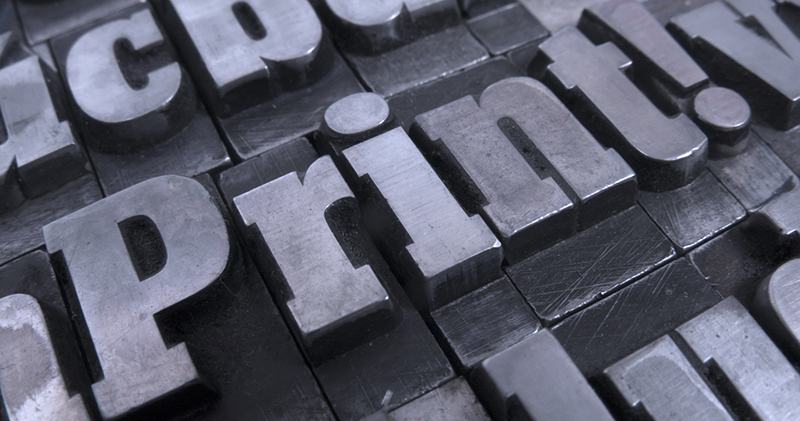 The right typography can convey a brand’s entire identity with just one glance. It’s an incredibly powerful tool. So, how exactly do you go about choosing a type that does all of these things when there are so many choices? What’s are the pros and cons for one font over the other? I know; it sounds complicated. Fortunately, that’s where us professionals come in. Graphic designers understand their purpose and objective is to influence a visitor’s psychological state of mind and recognition of their customers business. The more designers know about human behaviour, the better they can implement a persuasive strategy. Although it is globally known typing in all capitals is challenging to read, especially with a visual impairment or from a distance, graphic designers know how to manipulate the rules. In some cases, adding tracking or kerning can make those capital letters legible. What graphic designers can’t help with are rules such as using only one space after any form of punctuation or the differences between a hyphen, en dash and em dash. Experienced graphic designers understand what people want and need and how to convey it. We listen to the customer, assess these wants and needs, and then know exactly what type to use to convey their unique message. Then, carefully, we place the type on to the document, taking into consideration how the type best represents the emotional energy of the time, event or promotion. Accomplished and skillful graphic designers capture and hold the interest of an audience. We understand page format and grids; typographic hierarchy; how and when to use white space; entry point of the audience’s attention; how to place type and other page elements; design elements; and psychology of colour…all while being captivating and developing the ‘Wow!’ factor — we do so while being creative and unique. I love designing with typography standards and style guidelines in mind. To me, these enable and support readability and legibility. The very basics tell us that the difference between good typography and bad typography is how readable and legible a typeface is or is not. The reality is readability and legibility are the basic foundation of good typography. Readability pertains to how text is deciphered — how it flows from the page to the reader. Legibility is the clarity of the font and its qualities make it easy to read. In addition to readability and legibility, graphic designers need to keep Accessibility Standards for Information and Communication in mind. Understanding and knowing how to apply the standards for communication goes a long way! In addition, it is always important to stay in line with your customer’s best practices type stylebooks or guidelines when creating a layout. At Graphic a la Design, we are well versed on Canadian Press Stylebook, Chicago Manual of Style, Business Communication Style Guide as well as MLA and ALP Handbook Guidelines. The next time you go to pick a typeface, choose carefully! It is as big of a decision as choosing a colour, graphic or picture. Take the same care when you choose a graphic designer. Be sure to choose one who understands typography. Graphic designers should use a typeface as a tool, keep up to date with copy style guidelines and standards, and be open to the psychology surrounding typography; ensuring consistency with your brand or business.